Today (13 September) we set out on our usual weekly trip to water the trees we have planted in the last two years. 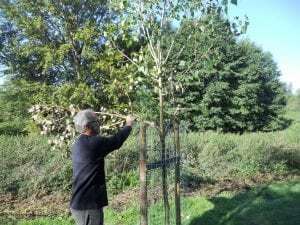 We started with the three poplars which we planted last year on the River Walk near Ebenezer Close and were angered to see that one of them had been vandalised. Three of the lower branches had been pulled down until they broke, a childish act, though not necessarily done by children. The tree will survive, though pointlessly disfigured. Our next port of call was the six trees we planted earlier this year in Bramble Road. As we set off to water the hornbeam, which is furthest from the road, we were hailed by a local resident. She told us that her house overlooked the site and the previous night she and her husband had been woken at half past one and, looking out, had seen two youths and a girl attempting to set fire to the hornbeam, using petrol. They had reported the incident to the police, who had not been encouraging, pointing to the lack of evidence to identify the perpetrators. In the morning the resident and her husband had found an almost full gallon can of petrol hidden in their hedge. They had reported this to the police, who had asked that the incident be reported to Braintree District Council as the landowner. The resident asked us to contact the Council and we will be notifying the Council’s Tree Officer. Fortunately, despite the obvious signs of fire, the hornbeam itself had not been damaged. It is worrying, however, that such a dangerous and irresponsible attack had been attempted and the perpetrators may well have expected to recover the petrol can for further acts of criminal stupidity. The rest of our watering round fortunately revealed no further evidence of recent damage, though two of the trees have survived earlier attacks. We recognise that senseless criminal damage is a modern hazard. The huge social benefits of trees are widely recognised, not least by the current Government. Trees are a long term investment and it is ironic that it is younger generation, among whom most vandals are to be found, who will actually suffer the consequences of these criminal acts. They are fouling their own nest.